I have this one memory about oranges. I realize that sounds very strange, but bear with me. When I was 16 my older brother, Alex, took me on a trip to Mexico City. This was not the spring break trip many kids my age went on then. My brother and I spent most of the time walking through the streets, perusing street market stalls and eating our weight in street food (hello tacos al pastor). One day there was a woman who had a grocery cart full of green-orange skinned citrus and a crank-style reamer bolted to the top. Taking a knife from her apron, she sliced the citrus in half, juicing deftly and quickly and, finally, handing me a plastic cup full of orange juice. I am not kidding, this was the best orange juice I ever had. It was sweet and floral, but had a slight tartness. This was not the orange juice I grew up eating. Now, whenever I see an orange or a glass of orange juice, I think of that orange juice. Story done, this leads me to this new recipe. Citrus, especially orange, goes so well with some more savory flavors and adds a brightness to any treat. It turns out that tahini and orange are a perfect match. Alright, let’s talk about a few things in this recipe. I love to use oat flour for gluten-free baking. It has a great flavor, added nutrition and it easy enough to make yourself. If you are going to make it yourself, buy gluten-free rolled oats, throw them in a high speed blender or food processor and blend until a fine powder. One thing that I have noticed with oat flour is that is more absorptive than other gluten-free flours so I only need to use one cup (usually I would use about one and a half cups of flour for cookie recipes). Now about this coconut flour. I have been experimenting with it recently in many different recipes and applications and found that it works super well as a binder. Other binders that I use frequently are tapioca starch, potato starch or arrowroot flour. Coconut flour works about the same, but also adds a little sweetness to the mix as well. Like the oat flour, it is very absorptive so you don’t need to add a lot. For this recipe, I decided not to use eggs (been working on honing my vegan skills). My favorite substitute is flax meal. However, I do not combine the flax and 3 tablespoons of water before mixing into the dough. I add the flax to the dry ingredients and 1/4 cup of warm water to the wet ingredients and let the finished dough set in the fridge. For this recipe, I used golden flax meal because I wanted to maintain the golden color of the cookies. If you don’t have golden flax meal, no problem. Just use the regular ground flax meal; the dough might be a bit darker, but will still taste just as good. One things that is a little bit different in this recipe is that I am using cane sugar. However, I do not use that sugar from the yellow box. First of all, that sugar is processed with bone char to keep the bright white color. Second, it is a highly refined cane sugar so that almost all of the natural colors are removed. The only cane sugar I use is organic cane sugar. It is not processed as much, maintaining a more natural color, richer flavor (in my opinion) and, more importantly, there is no bone char. I prefer cane sugar in this recipe over coconut sugar because coconut sugar will turn the dough a dark color. I wanted a nice bright cookie, While I may be using cane sugar, I am not using just cane sugar; I mix it with maple syrup. Maple syrup gives a lot of sweetness, but without using a lot. If you don’t have maple syrup, you can use agave nectar or honey. To borrow a phrase from Guy Fieri, flavor for this cookie is the most important. Tahini has a very earthy, savory flavor that sometimes can be too much on its own so pairing with other flavors is magical. For this recipe, I used the zest of a large navel orange, lemon extract (or you can use a tsp of lemon zest), ground ginger and ground turmeric. 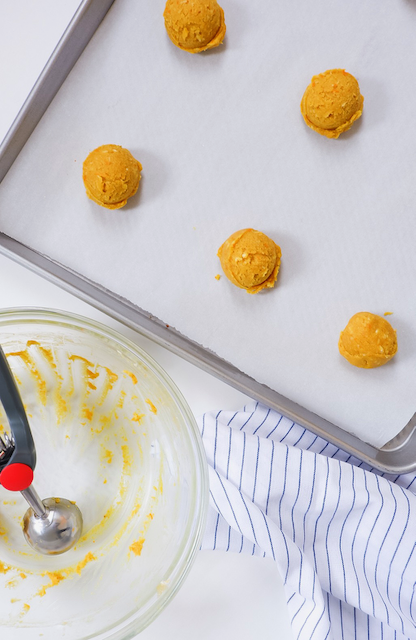 The turmeric gives a beautiful bright color and the ginger gives just a little bit of spice in the background that goes so well with the orange and tahini. Ok, enough talk, let’s make some cookies! In a medium bowl, whisk together the oat flour, coconut flour, shredded coconut, flax meal, ginger, turmeric, baking powder and salt. Make sure to get out any lumps in the oat flour. In a large bowl set on top of a zeroed kitchen scale, measure out 5oz (doesn’t need to be exact, but better to be slightly over). Add the coconut oil and microwave for 45 seconds. Whisk together the tahini and coconut oil. Add the zest, sugar and maple syrup to the tahini-coconut mixture. Whisk together until smooth. Add the water, vanilla and lemon extract (if using). After the little chill, preheat the oven to 350F and line a large baking sheet with parchment paper. Using a 1 1/2 tablespoon cookie scoop (or spoons), scoop dough onto baking sheet, leaving an inch or two between each. Bake for 12 to 14 minutes, just until the edges start to brown. Let cool completely before enjoying with a nice mug of tea or a turmeric latte. Makes about 1 dozen cookies. Store in an airtight container at room temperature for a week or freeze in an plastic bag for 1 month.